Winter Olympics has finally arrived! To celebrate, why not play a word definition quiz game with an Olympic theme? 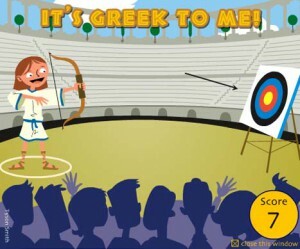 At the start of the game, players are asked to choose among four listed countries and to pick a category – Archery (for easy) or Discus (for hard). The players are then asked to provide the meaning of 10 words with their root word given as a clue. The performance of the athlete is dependent on screen is dependent on the players’ actions – get enough points right, and one could win a gold, silver, or bronze medal, which can be printed out to take home. If they’ve earned a medal, they can also proceed to the next round to give them a chance to earn another medal! Students can form groups and compete in this game as a team. How many rounds can each group last? How many gold, silver, or bronze medals did they earn? The group that goes the farthest round and earns the most significant medals wins! As an extra touch, the teacher can print out their medals immediately and hold an awards ceremony right then and there! Test your students’ knowledge about the capital cities of the world with this Smartboard Game. Each question has a timer, and every correct answer enables the player to earn points. The faster one answers, the higher the score. Students can compete against each other by playing through all three levels of the game and earning higher points than their classmates. Conquer the Continents tests a child’s knowledge about the countries of the world by making him pick the correct location of countries in a chosen continent within 60 seconds. Teachers can opt to let each student play individually, or to form groups, with the group scoring the highest number of flags winning the game. Another interesting way of playing the entire game as a group is for each team to fight over the “continents”; the team with the highest score for a continent “wins” that area, after which players move on to the next “available” land mass. The group that manages to “conquer” most of the globe wins the game. The objective of this game is to guide the turtle to a pond by means of giving a set of commands. Unlike other games of this type, however, the turtle will not immediately act upon the instruction left by the player. Instead, the student will have to carefully plot his way through a plane, building up a set of instructions that the turtle will follow only when the play button is clicked, with hopes that once it has reached the end of the list, it has successfully reached its target. 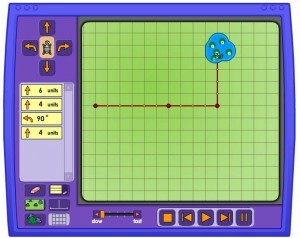 Aside from the default location of the turtle and the pond, the teacher can opt to choose other predefined configurations, which includes adding obstacles along the course. It is also possible to make the game even more challenging by removing the grid lines, or changing inputs so that the angle in which the turtle can move is no longer defaulted to 90 degrees. Though the game’s learning benefits for math classes are obvious, it is also quite an excellent tool for teaching young students a bit of basic computer programming skills by exercising their logical thinking without immediately seeing the results. This smartboard math game is only for higher grades. Students have to solve equations to x and find the matching card. Not easy, but a great way to involve the whole class quickly.